This recipe was originally written for the January issue of Waitrose Magazine as part of a set of Keralan recipes styled by Sunil Vijayakar and shot by Kate Whitaker. 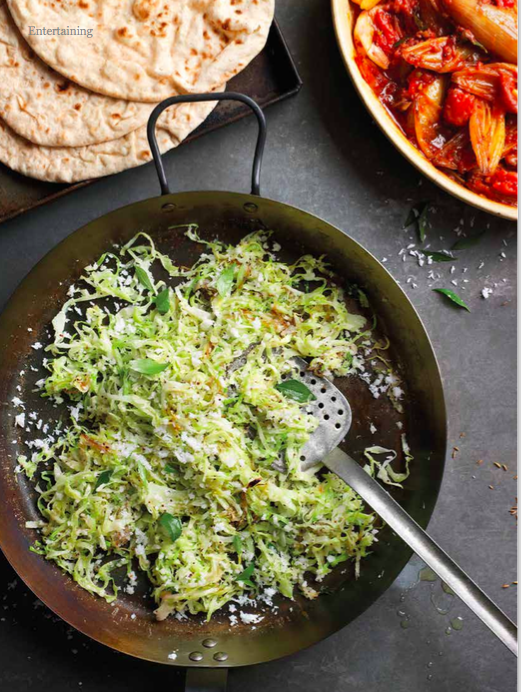 A thoran is a lively stir-fry classically made using cabbage tossed with coconut and a few spices such as cumin and mustard seeds, then spiked with chilli. In Kerala, it’s made with fresh curry leaves but you could also use dried. Heat the coconut oil in a large frying pan until hot, then add the curry leaves and mustard seeds. When the seeds crackle in the heat, add the red onion. Cook for about 10 minutes, until soft and starting to caramelise, then add the garlic and green chilli, and stir-fry for a couple of minutes. Add the coconut and cabbage and keep tossing and turning for around 4-6 minutes or until it’s wilted and tender. Add the salt and turmeric, squeeze over the lemon juice, then take off the heat. Season with a little more salt and lemon juice, as needed.